Tender & flavorful greens in very little time! Remove leaves from stems and wash thoroughly at least twice. We usually let them soak in the water on the first wash to help any stubborn grit loosen to be washed away. A little grit goes a long way, and can ruin eating them. Cut away as much or as little of the stem from the leaves as you like. The stems can be tough and bitter, so we remove quite a bit. Stack 7 or 8 leaves and roll them tightly, like you would a cigar. Then thinly slice across the rolled greens. At this point, we usually wash them one last time. Using a large sauce pan over medium-high heat - add oil and onions and cook for a few minutes, until onions are softened and translucent. Then add garlic, red pepper flakes, and vinegar. Cook for about 1 minute, but don't let the garlic become brown. 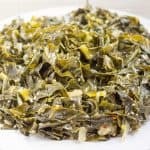 Add collards, stock, salt, pepper, and sugar and cook for at least 25 minutes, depending on how soft you want the greens. Stir them frequently to ensure even cooking, but keep them covered when not stirring. They should be perfect when all of the liquid evaporates. If all of your greens won't fit in your pan at first, cooke them for a few minutes then add the rest (in batches if necessary). The greens will cook down in size pretty quickly.